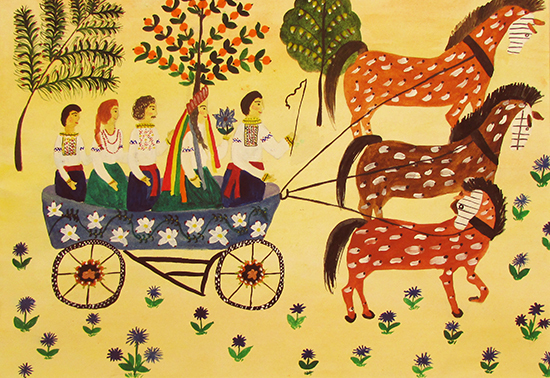 The Ukrainian Institute of Modern Art (UIMA) and the Ukrainian National Museum are pleased to host the children’s art exhibition From Past to Present. In this exhibition, the two museums invited children to explore the notions of cultural heritage by asking their grandparents what would they like to leave as a legacy. The Ukrainian National Museum, engaged the experiences and artistic skills of Chicago-based youth, while the Ukrainian Institute of Modern Art reached out to children living in Ukraine. The works by these young artists both illustrate the disappearing world of their grandparents, as well as encapsulate the riches that their elders would like the younger generations to keep for the future. “From Past to Present” highlights the most precious gifts that one can pass on to progeny: the gift of traditions.